There’s a reason why Stand for Children doesn’t want to refer to the school conversion clause in Initiative 1240 as the parent trigger. If you Google “parent trigger”, articles come up about how it has divided communities, how it has been used as a tool for charter operators to take over existing school buildings and how it started with Steve Barr, then the CEO of the Green Dot charter chain to open a charter school in Compton amidst much uproar by the majority of parents using an existing school building. (Which begs the question, just where do Bill Gates, Alice Walton and Stand for Children see all of these charter schools being located? The Seattle Public School district is above capacity right now in terms of class space). Oh yeah, and the other reason why Stand for Children denies the fact that the term “school conversion” is not the same as the parent trigger is because the parent trigger has been formalized as a model bill and pushed as legislation in 17 states by ALEC. Even with Steve Barr’s big fail in Compton, CA trying to take over a school building, the Heartland Institute, yes the same one who loves vouchers and questions the reality of climate change, the effects of second-hand smoke and other issues that may require government regulations, liked the idea and produced an outline for a parent trigger bill in 2010 that could be submitted by state legislators. In the Heartland’s version of parent trigger legislation, a school did not have to be failing to be converted by a simple majority of parents. Sound familiar Seattle? In November of 2010, Heartland took their outline to the “bill mill” ALEC. 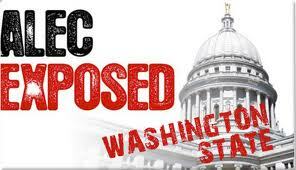 ALEC had the connections to provide the parent trigger model bill to legislators around the country. And that’s exactly what they did. So far seven states have some form of the parent trigger. According to Initiative 1240, a school doesn’t need to be “failing” to be converted into a charter school nor does the initiative require a school community to be notified of a petition being circulated. This, compared to other states, is pushing the envelope to the point that Washington State could have the most radical parent trigger law in the country. Is this what we want Seattle? Next Post: Parents throughout the US, take note of anti-public school legislation in your state.